Alberta Parks is investing $5.2 Million in infrastructure upgrades in the Lower Kananaskis valley this year. Planning is now complete and contracts tendered for construction this fall. There will also be 10 NEW Individual Campsites in the lower meadow that can be reserved for 1 - 16 nights. The timing of this construction activity is scheduled to start September 3rd and we are unable to take any bookings after the September long weekend. Group Campground Bookings for the 2019 season at Canoe Meadows opens to the public at 9:00 am on February 4, 2019. See below for how to book the campground. Paddling Clubs affiliated with the AWA are able to reserve their camping dates beginning January 1, 2019. Go to CAMPGROUND CALENDAR to look at the available dates. Please note that the calendar is updated frequently but may not have all the bookings listed at the moment you look. The booking system for Individual Campsites for the 2019 season is still being formulated with Alberta Parks. The campground operating season is April 15 to September 2nd. A minimum of 2 night stays for weekend reservations from April 15 – September 2. No minimum number of nights for weekdays, Sunday to Thursday nights. A Standard Weekend rate of $310.00 per night for the first 10 units. Every unit over and above 10 units will be $26.00 per night per unit. The Sunday to Thursday rate will be $155.00 per night for the first 5 units. Every unit over and above 5 units will be $26.00 per night per unit. Groups with less than 10 units on weekdays will be asked if they want to share the campground. Non-profit Associations can book the group campsite for weekends at a rate of $270 per night for the first 10 units. Every unit over and above 10 units will be $26.00 per night per unit. Non-profit Associations can book the group campsite for Sunday-Thursday at a rate of $135 per night for the first 5 units. Every unit over and above 5 units will be $26.00 per night per unit. A unit is described as a family group staying in a tent, camper, trailer or motorhome with one vehicle. Youth groups are counted as 3 people = 1 unit, no matter how many tents or vehicles are in the group. Rates include use of the campground, camp kitchen, and a select amount of firewood depending on group size. PLEASE NOTE: Canoe Meadows is a public area that is used extensively for canoeing, kayaking, rafting and surfing. Walking trails run through the campground meadow, along the forest edge and alongside the river. They are open to the public and may interfere with any private functions that you are planning. Please book accordingly if you do not want to be disturbed by outside users walking through your camping area. The campground operating season is April 15 to September 2. The 90-day window for making individual campsite reservations resets at 9:00 a.m. each day. Booking the Canoe Meadows facility opens to the public on February 4th, 2019 for the 2019 camping season. Send us an email to admin@albertawhitewater.ca or phone our offices at 403-628-2336 and ask to speak to Chuck Lee to make a booking request. If the date is still available, an email will be sent to you directing you on how to make a payment to the Alberta Whitewater Association to secure your reservation. Only make a payment after you have confirmed with the AWA office that the campground is available and the AWA has confirmed your booking request for the dates you are seeking. The reservation fee will be for the full amount of the group: - 10 units x 2-3 days for weekends or 5 units x 1-5 days for weekdays. Fees for additional units will be collected onsite by the Campground Host during your visit. Camping conditions are highly variable during the season; therefore, the reservation fees are non-refundable, except when the campground is closed by Alberta Parks. To receive a refund of the group camping fees, cancellations must be made more than ten (10) days before 2 PM of the scheduled arrival date (i.e. a cancellation provided by Tuesday, July 7 at 2 PM for an arrival date of Friday, July 17). If ten (10) days notice is not provided, the group camping area fees will be forfeited. Refunds are NOT given for weather, wildlife, insects, water quality, air quality, fire bans, liquor bans, car trouble, getting lost or evictions. In addition to the Reservation Fee the AWA requires groups to pay a Damage Deposit of $250 for the use of the campground and the equipment that we are providing for your convenience. https://www.albertawhitewater.ca/civicrm/contribute/transact?reset=1&id=9 This damage deposit is fully refundable if the facility and equipment is returned in cleaned condition. From Stoney Trail & TransCanada in Calgary – drive 59 km westbound on Highway #1 to the Kananaskis Country, Hwy #40 exit. From TransCanada Highway and Highway #1A in Canmore – Drive 27.5 km eastbound on Highway #1 to the Kananaskis Country, Highway #40 exit. From the TransCanada Highway – Drive south 5.6 km on Highway #40. Canoe Meadows Campground is located on the west side of Highway #40. The exit from Highway #40 is signed as Canoe Meadows. Begin slowing once you cross the cattle guard and can see the river on your right. Once you turn off the highway, drive through the public parking area to the gate on the far side of the parking lot next to the toilets. The campground is in the meadow past the gate. Group camping area account holders are responsible for the actions of all camping party members and any visitors to their group camping area. The Canoe Meadows facility will have a staff person on site to help you as necessary. Guaranteed check-in time is 4:00 pm. Early checkin may be available, check with the campground host or with the AWA office for availability. The front gate should be open and your group leader will have received instructions to unlock the front gate. If the gate is locked and you don't know how to open it, find the campground host and ask them to unlock the gate for you. Failing this, call the AWA office at 403-628-2336 for assistance. The campground host and your group leader will have the combination to the kitchen shelter. Your group is welcome to set up tents and trailers anywhere in the main meadow. Camping is not permitted in the forest surrounding the meadow. The meadow is capable of handling up to 50 large travel trailers and motorhomes. Help yourself and other campers to enjoy the peace and tranquility of Canoe Meadows by avoiding excessive noise. Loud partying, stereos at high volume and other rowdy behavior are not tolerated at any time. Constant running of generators is considered excessive noise. Please respect nature and your neighbours by keeping generator use to a minimum. Quiet hours are in effect in the campgrounds from 11:00 pm. until 7:00 am. Checkout time is 2:00 pm. Late checkout may be available, check with the campground host for details. When checking out, campers are requested to clean the campground area and the kitchen shelter, leaving them clean of litter and debris. Excessive litter or debris may result in your group not being able to book the campground in the future. Firewood and a splitting axe is provided for the Group Campground. The campground host will show you where the firewood for your group is located. You are responsible for the management of your wood supply. Addtional firewood can be purchased from the campground host. Collecting deadwood or cutting of firewood in the Park is prohibited. Fires can only be made in the kitchen shelter stove or the 2 group fire rings. No other open fires are permitted in the campground or the Provincial Park. Propane campfires must be situated on a hardened surface to prevent the ground from being damaged. There is a handpump well located in the campground. It is not recommended to use this water for drinking. Please bring water from home for drinking. There is a potable water source at the Visitor Information Centre. Keep food and waste water a minimum of 10 meters away from the water well so that the well is not contaminated. It is illegal to feed wildlife in provincial parks. Store food (including pet food) and toilet articles such as soap and toothpaste in your vehicle—never take these items into your tent or tent trailer. Seal garbage in plastic bags and use the bear-proof garbage receptacles to dispose of garbage. Recycling receptacles are located beside the garbage bins. There is a refrigerator and freezer in the kitchen shelter for dry storage or cold storage of food. You must clean the fridge and freezer that you use during your stay. If you want to use them for cold storage they require a small generator to run them. The campground host can make the AWA’s 3000w generator available for your use. You must supply the unleaded gas for the generator. Your group is fully responsible for the proper use and maintenance of the generator while it is entrusted to you for the weekend. When filling the generator it must be situated on a clean enclosed surface to prevent any spills from contaminating the soil. You are required to shut off the generator between 11:00 pm and 7:00 am each day. There is a Group Propane BBQ and Propane Stove available for your group to use. The BBQ is a group sized $1,000 unit and the Stove is a 3 Burner High Output $300 unit. We want to keep it clean and in good working condition for the next users and your next visit. You will be responsible for cleaning the BBQ after you are done using it. We will supply the cleaning tools and supplies. Failure to clean the BBQ to the satisfaction of the campground host will result in an additional charge for our staff to do the cleaning. Be careful when moving the BBQ on rough ground as the wheels and carriage are not meant for uneven surfaces. Any damages to the BBQ will be charged to your group. The BBQ is a larger group style unit and requires 2 propane tanks, one for each end of the unit. The propane tanks should last for 4 meals. You are required to supply filled propane tanks. The 3 burner propane camp stove requires 1 propane tank and it should last 4 meals. You must supply your own tank. The BBQ and stove must be used outside to vent properly and stored inside when not in use. Your group is responsible for the BBQ and stove while they are entrusted to you. Please drive cautiously and keep your speed in the campground and the public parking area below 15 km/hr. Children may be playing in the area and paddlers carrying canoes or kayaks on their head may not see or hear oncoming traffic. To prevent damage to trees and other vegetation, please keep all vehicles on designated roadways or the cleared field areas. Unauthorized vehicles are not permitted beyond the main meadow or down to the river. Operation of off-highway vehicles (OHVs) is not permitted in the campground or in the Provincial Park. The front gate should be closed to prevent people not in your group from driving into the Meadow. Provincial Park regulations require that pets are on a leash during your stay and while using trails to protect your pet, wildlife and other campers. Pets are prohibited on public beaches, in public swimming areas and in public buildings. Be considerate of other campers—please ensure that your dog doesn’t bark excessively. In accordance with the Alberta Gaming and Liquor Act, open possession and consumption of liquor or the use of cannabis is restricted to the Group Camping area. Liquor and Cannabis is prohibited in all public areas including the trails and walking paths, the public beaches, the washrooms, the public parking area and the day use areas. The Canoe Meadows Whitewater Training Centre is the home to National and Provincial Whitewater Teams and club athletes who train on this site to perfect their skills for Olympic slalom racing. The AWA encourages you and your group members to stroll down to the river to watch our athletes in action. We have an extensive slalom gate system and training site that is one of the best in North America and we want to maintain this high standard for our future Olympians. The wires and strings holding up the slalom gate system are an important sport training facility and they can be easily damaged if tampered with. Only trained and authorized individuals should move or adjust the gates. If the wires and strings are damaged and dragging in the river they can pose a lethal hazard to other paddlers or rafters floating down the river. If you see a problem with any of the gates, wires or strings please report it immediately to the Campground Host, the AWA office at 1-403-628-2336 or a Park's Conservation Officer to report the problem. The Kananaskis River flowing beside Canoe Meadows is a beautiful place to visit and to enjoy. However there are a number of safety concerns both in the water and off the water for visitors. The Kananaskis River is fast flowing and cold and can be very dangerous to poorly equipped or trained individuals. Please be careful when you are close to the river. The Kananaskis Riverwalk runs from the bottom of the lower race course up to the top of the upper race course. The Riverwalk is an uneven natural surface with roots and boulders that can easily trip hikers. It is narrow in places and quickly drops into the river. A slip or tumble into the river can result in a harrowing swim through a series of rapids and may result in injury or death. The lower trail is paralleled by the upper Escarpment Trail that runs alongside the Meadow. Steep banks and cliffs along the Escarpment Trail can be dangerous, especially when the trail is wet. Be careful near the edge, as the bank may not be as stable as it appears. There are 6 designated connecting trails from the top down to the bottom, The downtrails are selectively placed to make it easy to move upslope or downslope along the race course. Please stay on the trails and do not use any other informal trails to access the river. The AWA works constantly to maintain and upgrade the trail system at Canoe Meadows so that everyone can enjoy the river. Please respect this hard work by not damaging the trails, moving rocks or logs, or eroding the embankments. The Kananaskis River is dam controlled and water flow is turned off and on to generate hydro-electricity by TransAlta. When the river is off, it can appear to be quite easy to cross the channel. But if the water comes back on while your group is on the far side, you could be stranded overnight before it is safe to cross. Water is a natural attractant to children and they should be closely supervised and within arm's reach of a responsible adult at all times. The Alberta Whitewater Association is inviting applications for a mature couple to live and work at the Canoe Meadows Group Campground on the Kananaskis River in Bow Valley Provincial Park this summer. 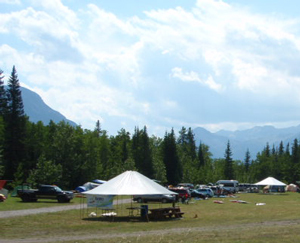 The Canoe Meadows Campground is located 6 km south of the TranCanada Highway just off Highway 40. The position will start May 1 and run through to October 15.This is a group campsite that requires pre-booking from all guests. Groups are generally canoe/kayak clubs and educational institutions. Major responsibilities include informing campers of park regulations, ensuring camper registration, keeping accurate registration records, revenue collection, selling firewood, regular cleaning of sites and washroom facilities and a daily inspection of the slalom gate system on the lower Kananaskis River. A 30 hour work week is anticipated throughout the summer. The Canoe Meadows Campground Hosts will possess a Drivers License and certifications in First Aid and CPR. Some upgrading may be provided. The campground host will have a roadworthy vehicle and a self contained camping trailer. Local travel is required and mileage will be compensated. Experience in public relations, logistical management, handling small tools are an asset. Rate of pay $2,000/month for an average work week of 30 hrs/week in the campground over the summer. Flexible schedule working around program needs including evenings and weekends is required. A free campsite is provided for the summer. This is an ideal position for those who enjoy the outdoors and interacting with the public. Its even better if you are a paddler.